This 10 x 18 steel-framed apex roof garage is a fantastic looking building. Once you step inside you will see it is also extremely spacious. This space allows you to store a large variety of garden items and tools and gives you the opportunity to use it as a workshop. The steel frame inside the building provides lots of durability and protection. It has been specially coated to allow the frame to prevent rust from gathering. The plastic coating also helps to prevent water from entering the building, ensuring your belongings are kept safe and dry no matter what the weather. This is a strong metal garage which is part of the impressive Storemore Duramax range. Built with an apex roof, the building offers a large amount of space and is totally weather-resistant. Apex roofs have become a popular feature on modern outdoor buildings due to the water-resistant features it boasts. The shape of the roof ensures that any water runs down and away from the garage, ensuring rust doesn’t become a problem. The fact that it also provides a lot more internal height is another big advantage to its design. If you’re looking for a tall, spacious garage then this is a fantastic choice. It comes with a roof height of 2.17m and an eaves height of 1.86m. 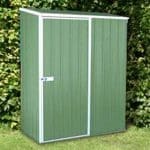 The double doors measure 2.23m in width and 1.80m in height, ensuring whatever you need to store can easily be transported into and out of the garage. It also boasts an impressive depth of 5.60m and a width of 3.21m. The garage comes with PVC Shiplap style cladding. As you will see, the building has a great, stylish design. 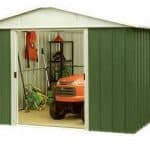 A lot of people are put off buying metal sheds as they have a reputation for being unattractive. This range really does blow that image away, ensuring you have an attractive building that is designed to last at least 10 years. The frame has also been built to provide ultimate stability and support. It is created with hot dipped galvanised steel. This material is both strong and rust resistant, providing excellent reassurance all year round. The building does come with a strong floor created with integral vinyl cladding. This is strong enough to support even really heavy storage. Due to the size of the building the one thing you don’t want to have to worry about is regular maintenance. Wooden buildings are well-known for their annual treatment requirements. However, the good news is this metal garage requires no maintenance. Yes you did read that right! Due to the tough materials used and their weather and fire resistant qualities, you never have to worry about giving it an annual protective barrier. It is designed to last without the need for any maintenance. We feel this is one of the buildings best features. So what kind of warranty can you expect from a building that doesn’t receive annual protection? Well, Waltons give you a 10 year anti-rust warranty. This means not only are you saving time and effort, but you’re also saving money too. One of the stand out features of this garage is the fact it has 3 doors. On the front of the building you will find two large double doors which open up to reveal a generous, spacious entry into the garage. Then on the side of the building you’ll find a single door. This means you have extremely easy access to your storage. There is one fairly small window included with the building. Considering its size, this one window doesn’t provide much in the way of natural lighting, but it is still a convenient feature. 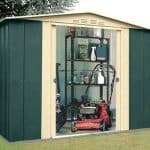 It means if you plan on using the garage as a workshop, you may not need to invest in an expensive electrical pack. While not technically a window, it is also worth mentioning the buildings integrated skylight. This adds plenty of lighting into the building, again reducing the need for an electrical pack. You are guaranteed a high level of security with this garage. This is because it has several security features. 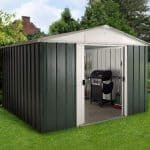 Firstly you have the peace of mind provided by the tough galvanised steel frame and the PVC cladding. It makes the building very hard to break into. Wooden garages for example can be broken down, meaning thieves don’t have to go through the door to get into the building. The other security feature you have is the pad-lockable doors. This ensures that only you have access to the building. The fact it does feature one window means that you don’t have 100% privacy. However, as mentioned earlier, the window is pretty small in comparison to the overall size of the building. So whilst people can see in, they won’t have a full view of the interior. However, just to be on the safe side we do advise you to keep anything of value hidden from view. One thing that needs to be improved by Waltons is the information available regarding extras. You’ll see they claim that there are a large choice of extras available such as a foundation kit, which can improve the garage. However, none of these extras are actually featured on the product page. So you will need to browse through the site to see which compatible extras and customisation options are available. This means you could potentially miss something that could prove really useful. 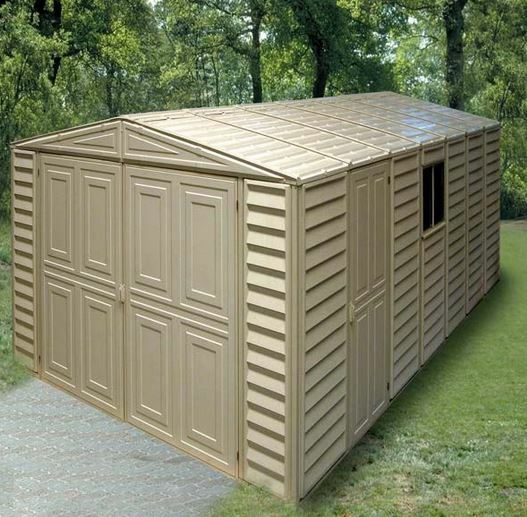 Unlike some of the manufacturer’s other metal shed ranges, this one doesn’t come with any free gifts. There’s not much to say regarding the quality of this garage. It is designed with exceptionally strong, high quality materials. There isn’t anything the company could do to improve its quality so therefore we are proud to give it a 10/10 rating. With the 20 year warranty against perforation and rust, you have peace of mind that the materials will really withstand the test of time. The building is designed to be fire, water and rodent resistant too and is protected against condensation thanks to the ventilated gables. With excellent depth and a high apex roof, the storage potential for this garage is fantastic. 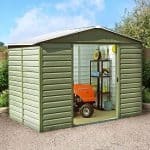 It is especially great for storing long vehicles, or would make a brilliant workshop. The garage is generally easy to install, but it does require quite a lot of heavy lifting. It will also take a lot of time to build, even with 2 people. This is because of the sheer size of the building. Compared to a lot of other Walton’s metal garages, this one is pretty expensive to purchase. However, when you combine all of its benefits and impressive features, you soon realise it actually supplies excellent value for money. It’s a long lasting building that offers great stability, security and a huge amount of storage space. Final Thoughts: We highly recommend this garage if you’re looking for a building that will really last. There are many things we love about its design and are impressed with its great range of features. It is extremely secure and private and the depth makes it a good choice for storing anything from vehicles to work benches and machinery.